Page Updated:- Tuesday, 02 April, 2019. Above sign left, December 2001. Sign right, 11 April, 2014 by Paul Skelton. Advertised as for sale for £675,000 in April 2014. Very popular community public house for sale. Substantial turnover with high profits. Spacious open plan bar with L-shaped servery, games area, commercial kitchen, level cellarage, rear trade patio and garden with children's play equipment, bat & trap pitch, smoking shelter, forecourt parking area. Three bedroom accommodation. From the Kent and Sussex Courier. 5 September 1873. Price 1d. George Waghorn, beerhouse keeper, of Brenchley, was summoned for unlawfully permitting drunkenness and riotous conduct in his house, on the 16th Aug.
Mr. W. C. Cripps, solicitor, defended. 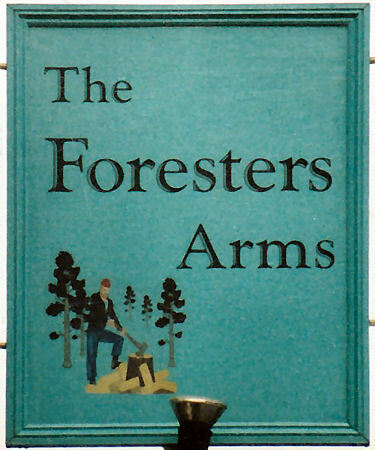 I. C. Holman said that at about four o'clock, on the after-noon of the 16th ult., he was passing the "Foresters' Arms" beer-house, Paddock Wood, kept by the defendant, when be noticed two men, named Henry King and William Semark, in the house, at the window, the worse for drink. Semark went out to speak to two men who were in a cart, and then returned. At about eight o'clock in the evening he heard of a row at the beer-house, and when he got near he saw a great crowd of people in the road. When he arrived there, they had left off fighting. King was lying upon the ground quite drunk. They left off fighting because a boy called out, "Here comes a policeman. "King had his coat off, and his face was covered with blood. Semark had also his coat off, with his shirtsleeve torn and his face covered with blood. Semark had also his coat off, with his shirtsleeve torn and his face covered with blood. King was led off by his wife. Semark followed witness, and used very abusive language. They wanted to continue the fight, but he (witness) prevented them doing so. He heard the landlord several times ask the parties to leave off. The landlord was standing on a piece of land in front of the house. By the Bench:- He had heard a great many more complaints against Waghorn's house. Mr. Cripps said if the Bench took that view, he should like the case adjourned, and he could bring a memorial, signed by every inhabitant of the place, to the effect that the house was properly conducted. The defendant had been in the house four years and a half. Ebenezer Taylor said that about half-past seven o'clock he went into the defendant's house, and saw King and Semark sitting down in a room. They were ‘beery,' but they were not drunk. He also saw a bit of a skirmish between them, and he saw King had some blood on his face. King had been lying upon the ground, but when the constable came he sat upon a seat. They stopped fighting when the policeman came. The landlord was outside when the fighting commenced, and he shut up his house. Mr. Goldsmid: What is the difference between a man being 'beery' and being drunk? Witness: Many a man can be beery without being drunk (laughter). By Superintendent Dance: Did not see King and Semark fight, but they had their clothes off. He and King fought. By Mr. Goldsmid: We were in the middle of the road when the fighting commenced. There were a number of others there. Mr. Goldsmid: I think you all ought to be fined. By Holman: When I went in the house, King and Semark were sitting down together. Mr. Cripps said he appeared for Messrs. Ken ward and Co., the owners of the house, who were most desirous that their houses should be properly conducted and entirely to the satisfaction of the police. He should prove that when these men had had two pints of beer, and finding they wanted more, the defendant closed his house, for which he should be complimented and not blamed. The defendant said he had conducted this house for four years, and had never had any complaint. On the day in question King and Semark called at his house in the afternoon at about two o'clock, and King had one pint and Semark two pints of beer. King was out and in during the afternoon, and Semark had some business with a gentleman about some fruit. Some words arose between King and Semark about boxing a child's ears, and he advised them to settle their quarrel somewhere else. Semark asked for more beer, but he refused to draw any. When King and Semark went out they met Taylor, and they had a row in the road. Immediately he heard the row he closed his house. After he had done so for about five or six minutes, he saw the policeman come, and they left off fighting. Alexander Joy, leather parer, said he saw King and Semark in the house, drinking together, between four and five o'clock in the afternoon, and he returned again at half-past six o'clock. They were then arguing about a boy. At about seven o'clock Semark asked for some beer, but the landlord refused to draw him any, and told them that if they quarrelled in his house he would put them out. Taylor came in, and he and King had words, and they went out. The landlord then closed the door upon them. By Superintendent Dance: I was apprehended at Ipswich for felony, and had twelve months' imprisonment for felony. In the afternoon I and the others who were with me had four pots of beer, and in the evening one pot. King and Semark were not drunk. By Mr. Cripps: I was apprehended over three years ago, and have earned my living respectably since. Thomas Bridger, a blacksmith, said he heard the landlord refuse to draw Semark any more beer. He left at five minutes past seven o'clock, and did not see anything of the fight. By Superintendent Dance: Semark and King were in the house at half-past one o'clock the same day. The Chairman said the Bench were of opinion that Waghorn permitted a great deal too much beer to be served to the people, and in this respect his conduct was reprehensible. At the same time they did not think he willingly permitted any disturbance in his house, and therefore they dismissed the case. He would, however, have to be very cautious how he conducted his house in future, and be careful not to give the police any ground for bringing a case against him. Mr. Cripps applied that as Waghorn's was one of the certificates that had been adjourned for a month, he (Waghorn) need not attend at the adjourned licensing day. The Bench said Waghorn need not attend. The men William Semark and Henry King were charged with being drunk and riotous at the same time and place. The evidence of the witnesses for the prosecution in the former case was read over. Holman, in answer to Semark, said he did not see him fighting. He had asked a bailiff to come but he denied knowing anything about it. Taylor, in answer to Semark, said he did not let him fight. In answer to Supt Dance he denied that he had been promised anything to give evidence for the defence. He had not had any conversation with them. James Taylor, a brick-maker, said he was passing by the "Forester's Arms," when he saw King strike at his son several times, and when he struck him he (Taylor jun.) returned the blow. Semark took Taylor up, when a man named Saunders struck him (Semark) on the nose making it bleed. He was not in the house at all. He did not take much notice because it was nothing. John Barden, farmer, said that he saw Semark at half-past four o'clock and he was not drunk then. The Bench adjourned for about a quarter of an hour, and on their return the chairman said the Bench were of opinion that both defendants were guilty, and they should fine King 5s and 9s 6d costs or 14 days, and Semark 2s 6d and 9s 6d costs or 7 days. The witness Taylor jun. was then called forward, and told that his conduct was very reprehensible. They cautioned him that his conduct on this occasion would be remembered. Supt Dance: You will disallow his expenses. From the Kent and Sussex Courier, Friday 30 January 1874. John Coleman, of Paddock Wood, labourer, was summoned for unlawfully assaulting and beating Richard Harris, leather parer, at Brenchley, on the 17th inst. Complainant said he was a leather parer in the employ of Mr. Tompsett. 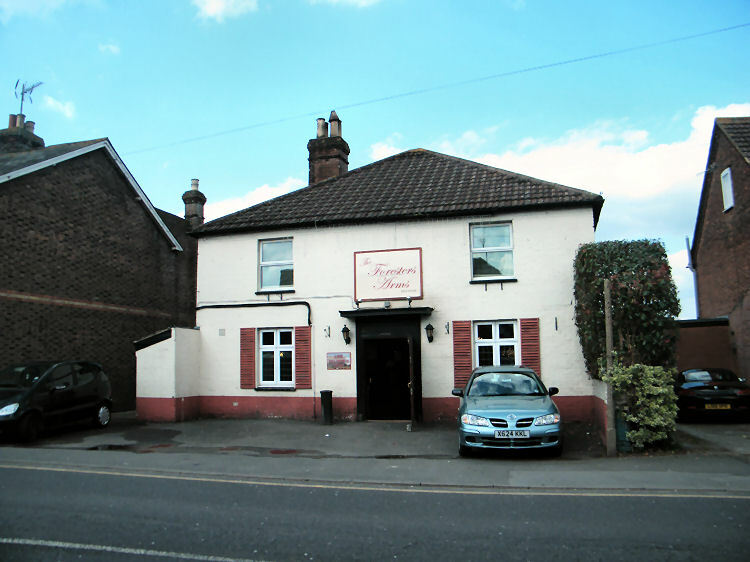 On the 17th inst., he went to George Waghorn's beerhouse (the "Forester's Arms"), Paddock Wood, at about a quarter to eleven o'clock, and when he was talking with a man named Fuller, the defendant went up to him and after acting towards him indecently he struck him. Defendant and two others followed him home, and there again defendants struck him on the eye. He had not spoken to the defendant previously. Thomas Fuller, labourer, gave corroborative evidence. Defendant said he and complainant were drunk. The Bench fined the defendant 10s. and 17s. 6d. costs, and in default of payment in a fortnight 14 days' imprisonment. Kent & Sussex Courier, Friday 29 May 1896. George Waghorne was charged on a warrant with using threats to his wife, who said her husband came to the home she had got together in Shatter's Wood, and having threatened to rip her open and struck her, smashed the furniture. Defendant pleaded provocation, and the Bench bound defendant over in his own recognizance of £5 to keep the peace for 3 months, on his promising to be of good behaviour. The Chairman said they thought the fault was not entirely on his side. I did not like to have such people in Tunbridge Wells, but they had to put up with them. 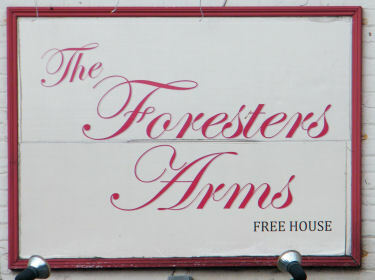 No opposition was offered to applications for full licences made by Percy Smith, "Forester's Arms," Paddock Wood.